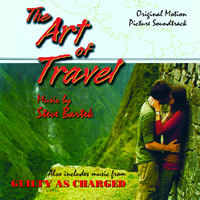 BUYSOUNDTRAX Records presents the original soundtrack to THE ART OF TRAVEL/GUILTY AS CHARGED featuring music composed for two films composed by Steve Bartek. He is best known for his role as composer, producer and conductor for film and television (including NOVOCAINE, THE CREW, THE TICK and DESPERATE HOUSEWIVES), orchestrator for dozens of popular film scores (including CHARLIE AND THE CHOCOLATE FACTORY, BIG FISH and SPIDER-MAN) and as the lead guitarist, co-arranger and co-producer of the rock band Oingo Boingo. Released in 2008, THE ART OF TRAVEL was directed by Thomas Whelan, written by Whelan and Brian LaBelle, starring Christopher Masterson, Brooke Burns, Johnny Messner, James Duval, Jake Muxworthy, Shalim Ortiz, Angelika Libera and Bijou Phillips. THE ART OF TRAVEL tells the story of Connor (Masterson), who after bad breakup with his fiancée, goes off to Central America to travel on his own, eventually joining up with a group of explorers seeking to set a record hiking through the Darién Gap, a large swath of forested land alongside the Panama/Columbia border. In the process, discovers a profound love for exploration, finds true love with a fellow explorer and discovers himself in the midst of it all. In 2008, Steve Bartek was approached by the producers of THE ART OF TRAVEL to score the film. Working steadily since 1991, he had scored a dozen films and almost as many episodes of television. By coincidence, Bartek had been building his own home recording studio and thought the project would be a great opportunity to show he could create and record a score by himself, in his own studio. The end result is a vibrant and contemporary mix of electric guitars, ethnic instruments, exotic percussion and string quartet. Released in 1991, GUILTY AS CHARGED was directed by Sam Irvin, written by Charles Gale and starring Rod Steiger, Lyman Ward, Lauren Hutton, Heather Graham and Isaac Hayes. GUILTY AS CHARGED tells the story of Ben Kallin (Steiger), a religious vigilante who captures criminals who have escaped justice and executes them in a homemade electric chair hidden in the bowels of his meat packing business. Kallin serves as judge, jury and executioner with the intention of obtaining justice for those who have been let down by a corrupt legal system. Kallin is supported by his assistant, the Reverend Aloysious (Hayes), who ministers to the condemned before their night of execution. Kallan’s operation is disrupted when he becomes involved with corrupt politician Mark Stanford (Ward) and his condescending wife Liz (Hutton). Kallan learns from Kimberly Allen (Graham), a probation officer who has come to believe in Kallan’s crusade, that one of his captives has been framed by Stanford in order to gain points in the polls during an election year. To score GUILTY AS CHARGED, the producers were looking for a composer who would play it straight and not acknowledge the quirky beats of the film’s dark humor. Once director Sam Irvin heard the synth mock-up of the score, he pushed the producers for enough funds to pay for a full orchestra session, recorded in Seattle. Performed by a sizeable orchestra of around 65 players, the end result is a wonderful Bernard Herrmann pastiche, the complete antithesis of the composer’s work on THE ART OF TRAVEL. BUYSOUNDTRAX Records presents THE ART OF TRAVEL/GUILTY AS CHARGED, featuring music composed by Steve Bartek. THE ART OF TRAVEL/GUILTY AS CHARGED represents the first album release of the composer’s work. The booklet includes liner notes by author Randall Larson, including input from the composer. THE ART OF TRAVEL/GUILTY AS CHARGED is a limited edition release of 1000 units.